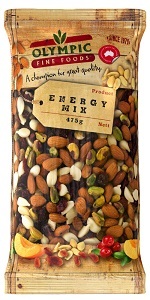 Olympic Premium Energy Mix is the ultimate blend of healthy Nuts and Dried fruit, mixed with White Chocolate. Full of Australian almonds, juicy cranberries, Pistachios and the ultimate indulgence White Chocolate Buds to produce this longtime family favourite. Love our Energy Mix product?